For myself and DH I suppose Wednesday is a day that will live in our memory as we are finally able to say that this little boy who has been in our lives for 7 months & 23 days became ours and only ours. Bizzarely I was at the hairdressers on our first adjourned final hearing date 6 weeks back and once again we were there this Wednesday when I got the phone call to tell me it had all gone through. It is strange looking at our little boy and knowing that he is ours legally with no-one we share parental responsibility with. Of course it wouldn’t us without one last wiggle on the path. Originally had a celebration hearing date set for 27 days from final hearing but courts no apparently have to leave 28 days to allow birth parents one last chance to appeal 🙁 So our celebration hearing is now almost 7 weeks after final hearing as the next date court had was during our holiday. So DH gets to celebrate his birthday by having the final acknowledgement he has a son – as he says it is one of the best birthday presents he could wish for. 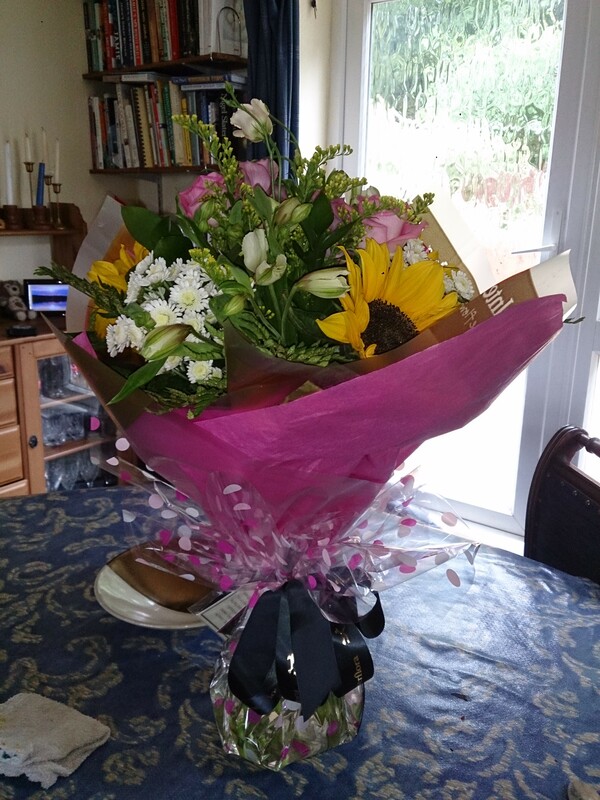 We celebrated on Wednesday with a sneaky kir, and only today we got a lovely bouquet of flowers. The story behind the bouquet is long and complicated as it came from the parents of one of our great friends (& one of the two we blame for us meeting) . She was a referee and due to an alleged safeguarding issue with her father we had fa slightly complicated time through our approval process. The news that all allegations had gone came to them as a family the night before Sqk moved in permanently and I think she and her parents have a great deal of feeling about our little boy because DH & I were absolutely determined that our friend was going to be involved and also were very much of belief that the allegations were wrong. I think these flowers are in part an acknowledgement of the unsaid support we gave them for the 18 months of hell they went through as a family. Our friend is seriously looking at adoption as a singleton so loves the time she can spend with Sqk. All in all a week of highs & lows (main low being the accident Sqk had this morning which has left him with a lovely black eye & graze above his left eye). But a week we shall remember. Congratulations guys! Hearing the news of the order going through was such a special day for us too. Mundane in many ways but so momentous at the same time. Fab. It’s insane isn’t it. You’d think the formal hearing and the granting of the adoption order would be as final as it gets. But nope. We’re at the same stage as you but ours have been with us 25 months. Celebration hearing mid June. Can’t wait. Congrats!!! Very happy for you all!